Opened by the Severn Valley Railway - a private railway company under the close paternalism of the GWR into whom it would shortly be absorbed - in 1862, Bridgnorth was a major station on the line that then ran from Hartlebury Junction through to Shrewsbury. 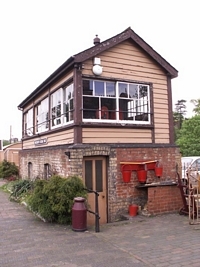 The station succumbed to closure in 1963 however, from 1965 onwards the Severn Valley Railway Society was formed and prevented the site from degeneration into ruin and ultimately saved it from demolition! As with the rest of the operational stations on this line, the modern-day SVR have done a fantastic job of maintaining the feel of an operational steam railway with great attention paid to detail as I hope the photographs below will show. 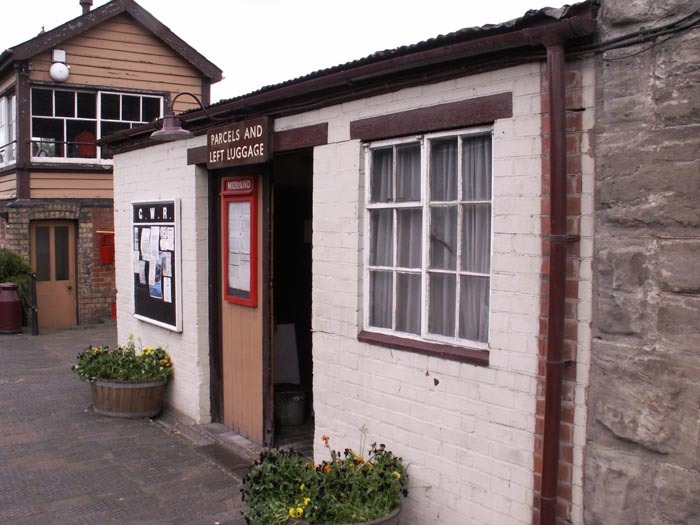 Bridgnorth now forms the end of the line for the SVR as the section of line North from this station is unfortunately now blocked by development. 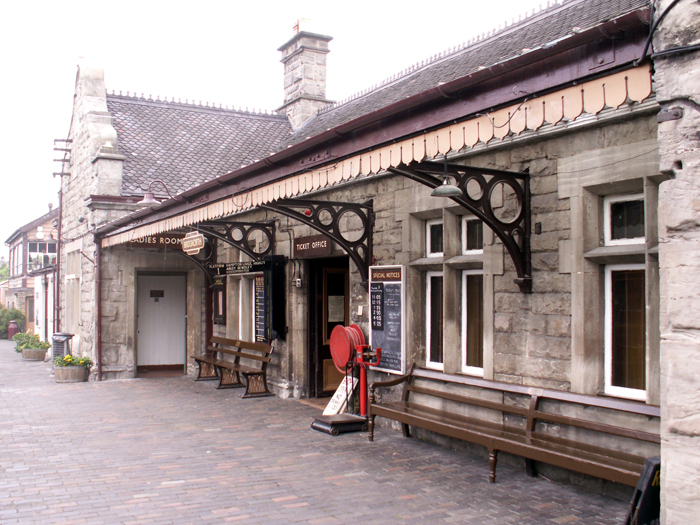 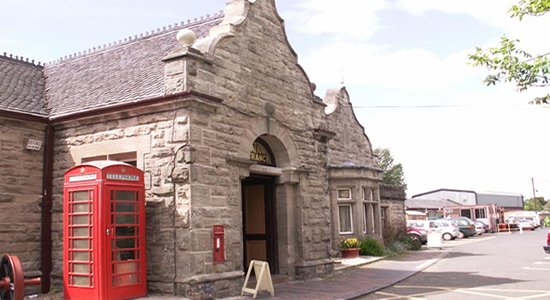 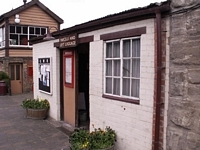 Above we see the entrance to the station booking hall. 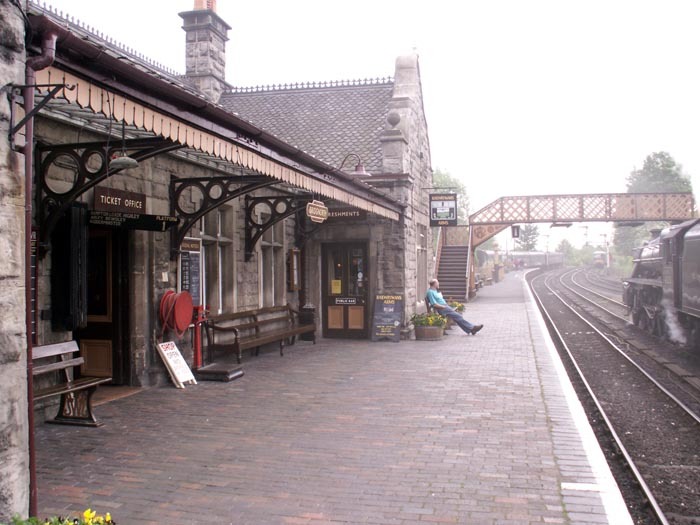 Above-left we have walked through the booking hall and emerged onto the Kidderminster platform and are looking at the trackside of the station building: not the signal box ahead and the GWR trademark darted fringe along the canopy. Above-right we are still on the Kidderminster platform but have turned to face Kidderminster through the footbridge. 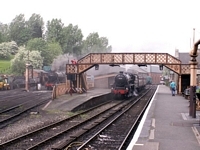 Above-left we see the 'Left Luggage' office on the Kidderminster platform and the signal box beyond. Above-right we have walked to the other end of the station and can see a corrugated iron 'hut' on the platform reminiscent in construction material of many of the GWR halt/platform pagodas. 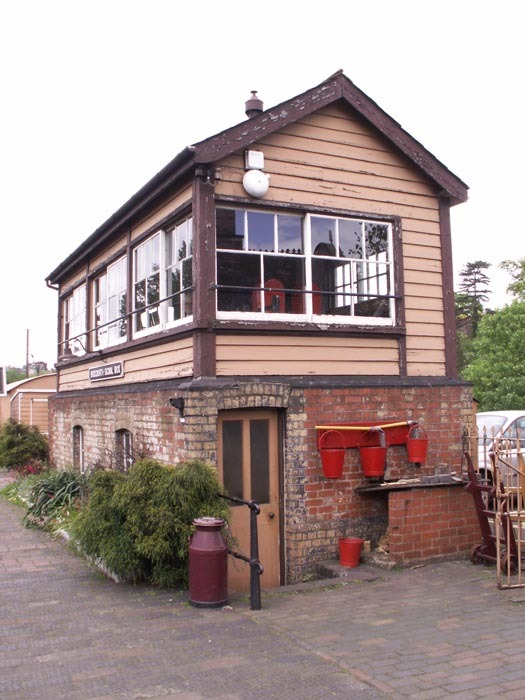 Above-left we take a closer look at the signal box, complete with fire buckets and the nice touch of a period milk churn placed on the platform. 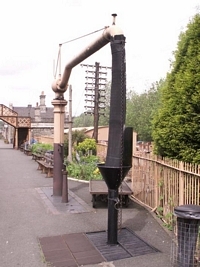 Above-right, at the other end of the station, we see a water hose which, unfortunately on my visit was not used but I was informed that it was fully functional. 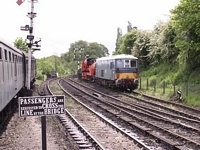 Above-left we have turned 180 degrees from the previous shot to watch the line head-off towards Kidderminster. 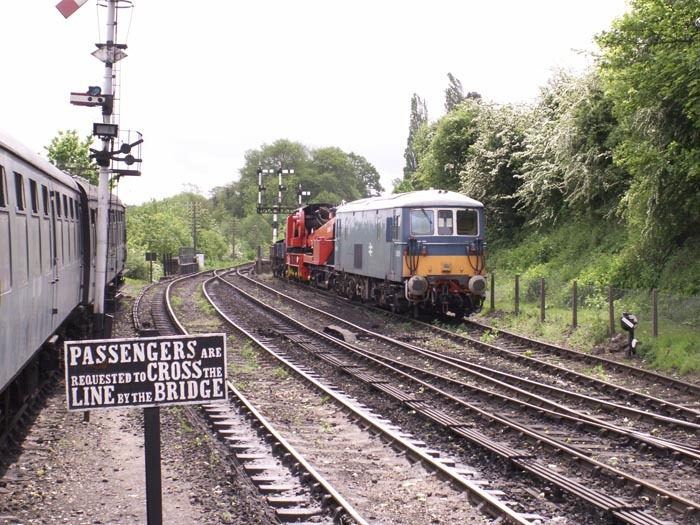 A class 73 waits in sidings at the head of a crane train. 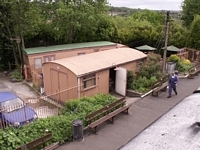 Above-right we have mounted the footbridge which provides a great vantage point for viewing the entire site. We are looking North as Stanier Class 5 4-6-0 No.45110 (originally LMS number 5110) hisses away beneath us. 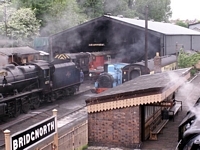 Above-left we have turned to the left from out previous photograph to view the Bridgnorth loco shed which was busy on my visit. 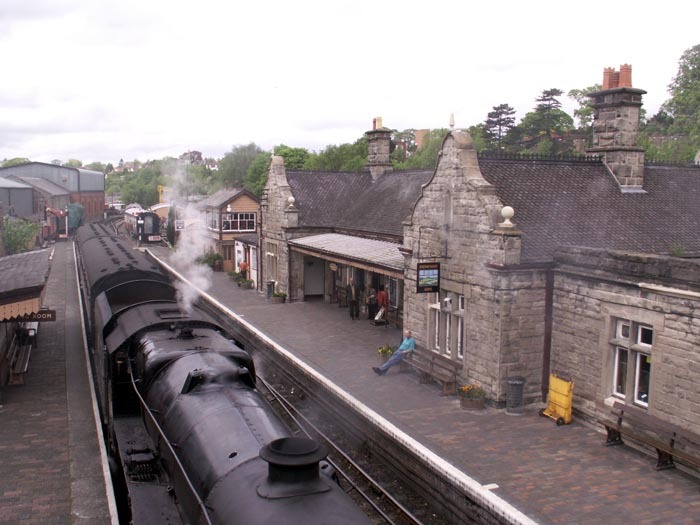 Here we see Stanier Class 8F 2-8-0 No. 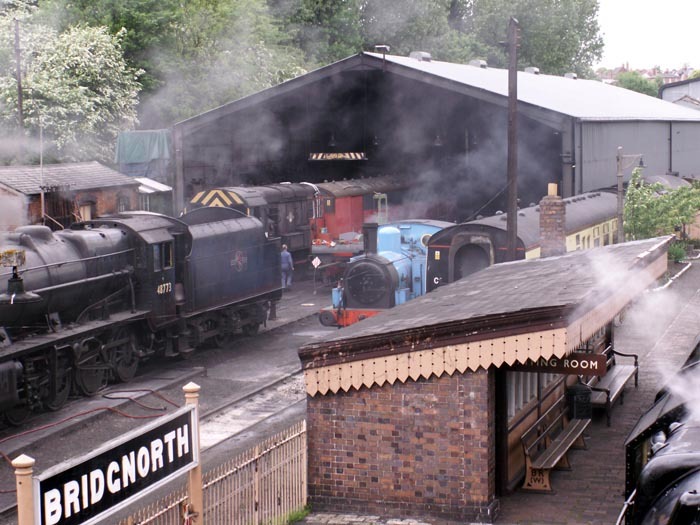 48773 in steam in the yard and beyond, a class 08 diesel shunter and the seemingly omnipresent preserved railway mainstay Thomas the Tank Engine! 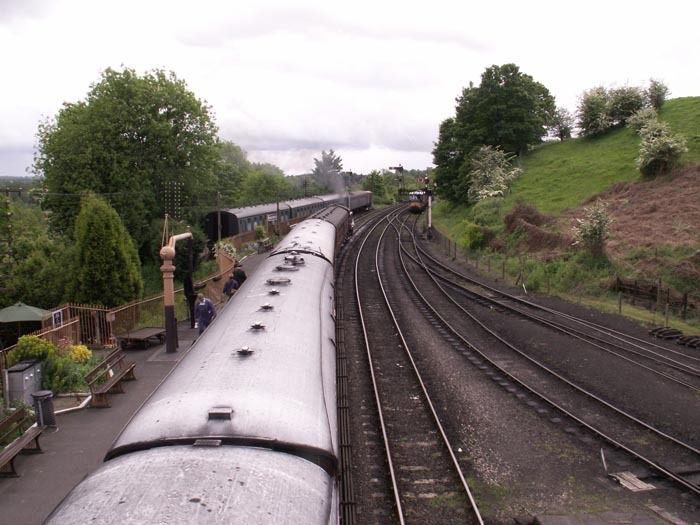 Above-right we are looking towards Kidderminster as a train hauled by Class 15XX 2-6-0PT No.1501 prepares to depart. 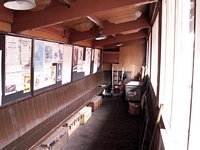 Above-left, to gain some perspective, this view is from the Southern end of the Kidderminster platform looking North. 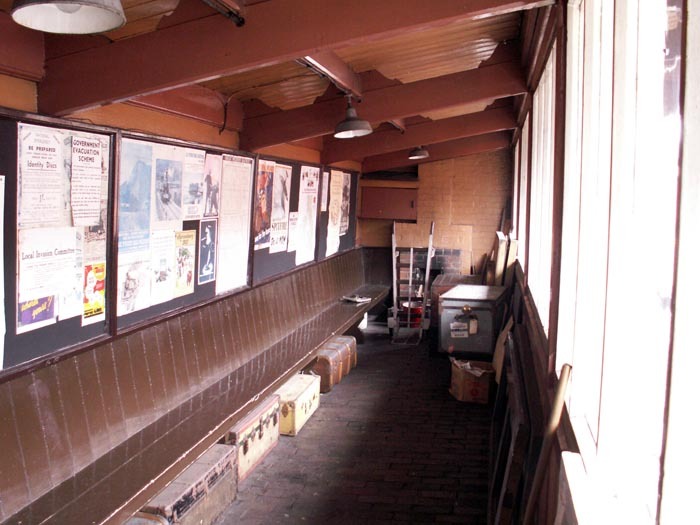 Above-right we take a look in the ex-Northbound platform waiting room (which can just be discerned to the left of 45110 in the previous shot) which shows great detail including porter's trolley, period notices and luggage under the benches. 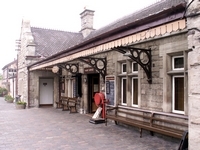 This is a fantastic site to visit and I would urge everyone to take a look however, I would recommend visiting outside public holidays if you really want to get the most out of your visit as there are few people to walk into your shots should you wish to take photographs, the staff are free and more than willing to have a chat and you can really get into the atmosphere and sounds of the railway without interruption - if you visit during holidays the converse is true: this is a really popular preserved railway and enjoys significant passenger traffic which is great for its continued growth and economic wellbeing but a bind if, like me, you enjoy a leisurely amble around such places!